Pros: Suma’s Ecoleaf toilet paper & kitchen towel products are made in the UK with 100% recycled paper from a blend of consumer waste and offcuts from manufacturers’ waste. The100% compostable wrap is sustainable, renewable, non-polluting, non-toxic and unbleached. So far so good. Cons: Paper collected for recycling includes many items such as thermal receipts and magazines that contain a nasty type of plastic called BPA. There is much written about this on US websites. If you want to avoid contact with BPA and are worried about flushing plastic chemicals down the loo and ultimately into the oceans, don’t buy recycled paper products. 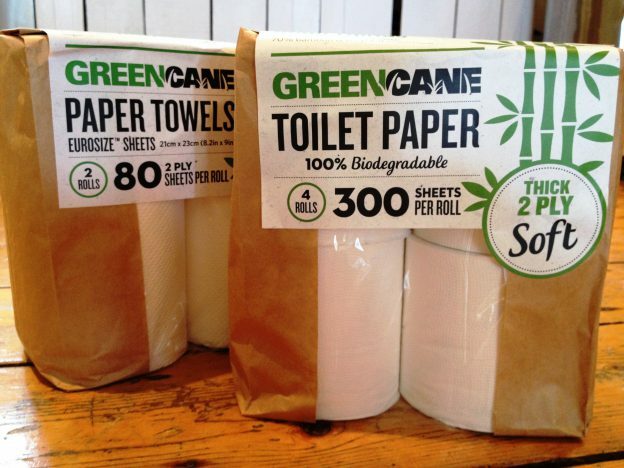 Pros: Greencane paper products are made from 70% recycled sugarcane and bamboo fibre and 30% certified wood pulp. Packaging is 100% compostable including the see-through cellophane. The whole lot is sustainably sourced and is free of inks, fragrances and plastic. I like this product very much (see picture). Cons: Greencane paper was developed by a couple from New Zealand, is produced in China and is therefore shipped a long way. It’s probably more expensive compared to the other options. Pros: You may think I’m kidding but just search for fabric toilet cloth on the internet and you will find that a lot of families do this. Made from old fabric, disposed of in separate bins and then carefully laundered – no packaging, no carbon footprint. Cons: I could probably come up with something, but fabric toilet cloth brigade I salute you! Nevertheless, I’m going to stick with Greencane paper for now. This entry was posted in Bathroom and Cosmetics, General, In the kitchen and tagged kitchen towel, non-plastic packaging, recycled toilet paper, toilet cloths on January 13, 2017 by admin.